“With energy costs rising, homeowners are searching for the most economical solution for their indoor comfort needs when it comes to both heating and cooling. Thermo Pride hybrid heat dual fuel system combines your existing oil furnace with a heat pump to deliver an energy efficient alternative to switching to gas. The dual fuel system is so efficient that the cost to heat with it is less than with any gas furnace available on the market today. Perfect for climates that experience cold seasons and temperature fluctuations. Additional electric heat will not be needed in cold winter months. Options are available, such as humidifiers, de-humidifiers and air filtration variations. Custom adjustments specifically made for your climate. If your cold season goes from late October to late February, the dual fuel furnace makes sense because an oil furnace setting will kick in to bring warmer air faster throughout the home on the coldest days, and a lower fan speed natural gas setting on mild days will allow for less energy to be used to warm the home. Your home will be more comfortable during the coldest days, since you can control how the furnace operates depending on the temperature. You will be able to get rid of your space heaters once you have a hybrid system in place, since the overall temperature will be more comfortable in every room of your home. 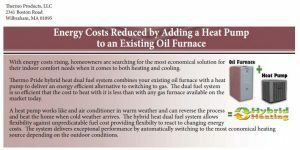 Discounted natural gas rates, more efficient heating and versatility are reasons that dual fuel furnaces are becoming popular choices for homeowners and business owners. At Berico, we carry a variety of brands for dual fuel furnaces, including Lennox, York, Goodman, Armstrong Air, and Thermo Pride. In Greensboro and Eden, dual fuel furnace installations are done by our certified and trained technicians, who will guide you through the functions of the new hybrid system.